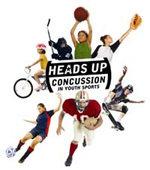 To help ensure the health and safety of young athletes, CDC developed theHeads Up: Concussion in Youth Sports initiative to offer information about concussions to coaches, parents, and athletes involved in youth sports. The Heads Up initiative provides important information on preventing, recognizing, and responding to a concussion. and seek the advice of a health care professional.